I removed wood paneling in a room to reveal shoddy plaster & lath. I covered it with 3/8 in. drywall. I now need to add spacers to electrical outlets and a light switch. Before we even get started, there's a bigger issue here. Before discussing the box and opening, note that the armored cable is not properly connected to the box. 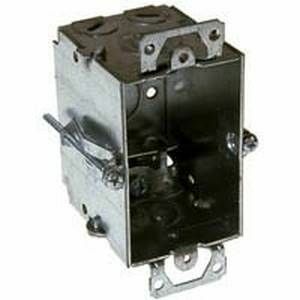 There are boxes with internal clamps for armored cable but I do not recommend using those, I'd get fittings that connect the armored cable through knockouts with a locknut. If you're not 100% sure of yourself using these fittings with armored cable, call an electrician to make this repair, getting it wrong can be dangerous. It is extremely important to install these correctly without damaging the insulation of the wires on the sharp edge of the armor. The rest of this task is pretty simple but like most things, the devil is in the details; you have to select a suitable box, and the details are very important. The details are more complicated than they may seem at first glance. You probably can't use the existing hole as-is. The original question is how to make this right without making a bigger hole. However, code demands that there be little to no space between the box and the opening in the plaster / drywall. You know how with a haircut, it's very easy to make it shorter, but just about impossible to make it longer? It's kind of the same way with the hole in the wall. It's easy to enlarge it, but a lot of work to make it smaller. So for practical purposes, you either you need to find a box that's just the size of this hole, or find a larger box that works, and enlarge the hole. I don't think you're going to find a suitable box the exact size of this hole that meets all the requirements. What kind of box will work? 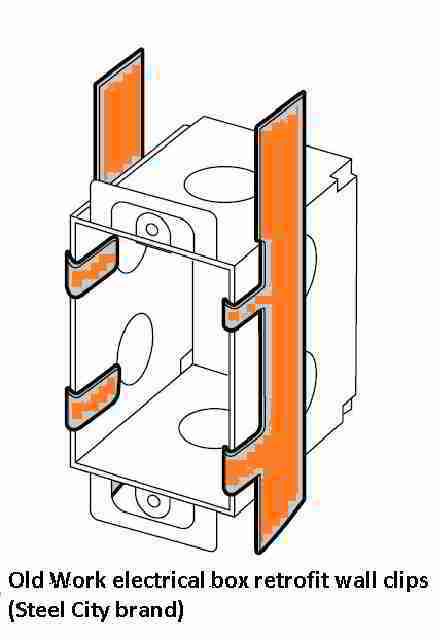 To simplify bonding the cable armor, it's simplest to stick to metal boxes. A plastic box would be nice because they are a little bigger than metal boxes, but bonding the cable armor presents an additional challenge. I think a decent solution is possible with a metal box, so I won't go into this more complicated possibility. You want a device box - one with threaded holes in the face of the box that you can screw devices (switches or receptacles) to. Device boxes are also known as switch boxes, even though you can use a switch box for receptacles as well - that's why I prefer the less-used term "device box." You can see that the existing box is a device box - but that isn't all you need. As mentioned above, code requires that the opening fit tight to the box, and it's hard to make a hole smaller. It will be difficult or impossible to find a single gang old work device box to fit the existing opening. So you'll probably be forced to use a two gang old work device box, and enlarge the existing opening. You can install a second duplex receptacle in the same box, or use one receptacle and a half-blank two gang cover. To keep things simple, you'll want a box with pre-punched knockouts for your armored cable fittings, and you'll want them in places where the fitting won't interfere with getting the box into the opening. 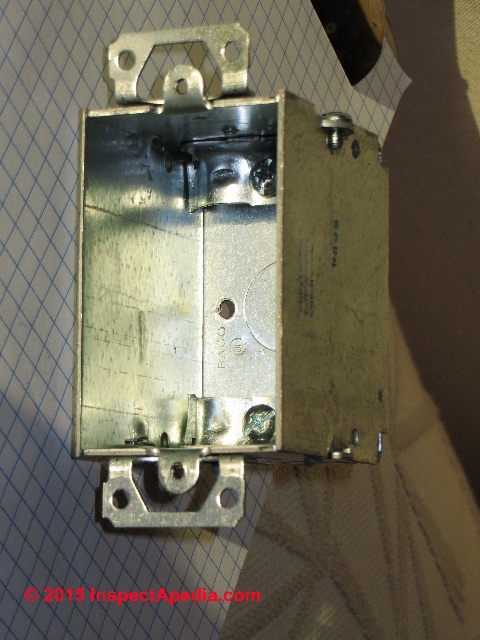 The existing box side knockouts may have made it difficult or impossible to get the box into the opening with armored cable fittings attached. 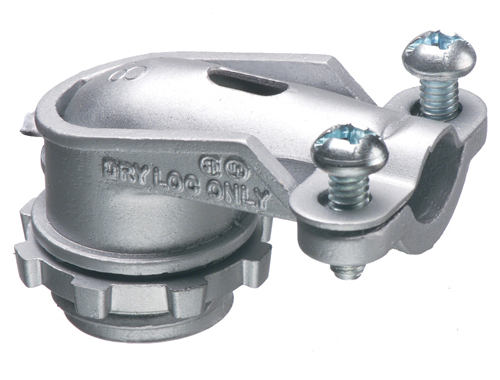 If you have to use knockouts on the back of the box, you may need to use right angle fittings unless the wall hollow is very deep. It has hold fast clamps on the sides, so you won't need F clips. (Edit: since you're going into wood molding, you can actually just pry off the hold fast clamps.) A deeper box would be ideal, but this one will work. 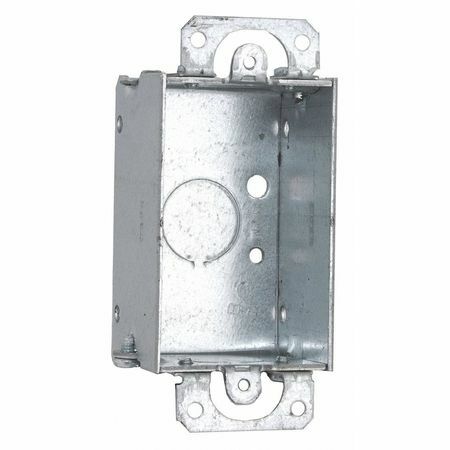 The KO's are probably too close to the face of the box to enter the box on the top or sides, but it's no big deal to buy right angle armored cable fittings, so this box would work. The simplest way is to replace that box with one that has flanges on each end (and built-in clamps in the back for that flex conduit). The flanges have holes for #6 flathead screws. Drill a small pilot hole* for each of the four screws through the plaster and into the lath, and simply screw it to the wall. The diameter of the drill should be equal to --or a little smaller-- than the root (smallest) diameter below the threads themselves. That'll be near the tip of the threads. You are going to need metal tabs that go behind the drywall then fold into the box to keep it secure. These tabs are strong, but kind of harder to get installed. You will have to take the plug out to make room to fold the tabs inside the metal box. While you are in there, you really need a clamp to hold each wire to the box. (only one wire per knockout). If there is room bringing the wires in from the back of the box will make is much easier to slip into the hole in the wall. 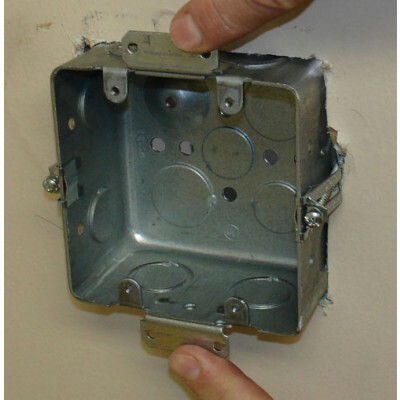 with e wire properly secured to the box, Start by slipping the tabs behind the wall and plaster. Now put the box in and bend the tabs inside the box. Reinstall the plug and you are done. If you were not dealing with armored cable a new plastic rework box (home depot link) would arguably be the easiest sulition. We can't see what the back side of the wall is from your picture, but in the rare case that it's not another piece of gypsum board and is instead something suitable for driving screws into it also works pretty well to put a shim behind the box of sufficient thickness to make the front of the box flush with the surface of the wall, and then screw it to the far side of the wall. 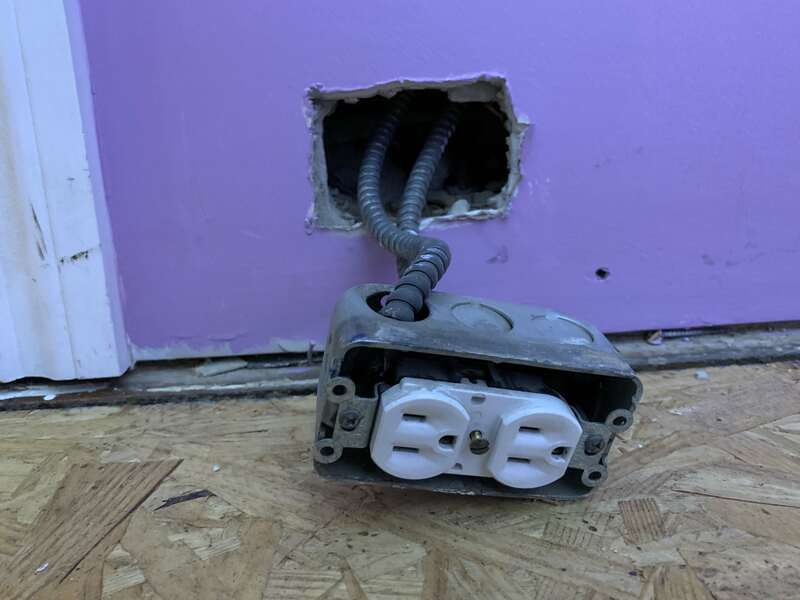 This isn't something you can do very often, but it has the advantage of not relying on the rather weak wallboard to hold the box, so someone snagging a cable at the wrong angle is much less likely to damage the wall along with the socket. Not the answer you're looking for? Browse other questions tagged electrical drywall walls or ask your own question. Can I change a 1-gang electrical box to a 2-gang electrical box? Why were only some of my tools damaged when connected to a 240V receptacle? Neutral wire is tied to my electric metal box, why is it so?